Jay in Hell (seriously, the spring above is called a Hell/Jigoku) with a pretty student guide from the university that hosted us, and both of us on a guided tour of Kitsuki. It was my kimono day! 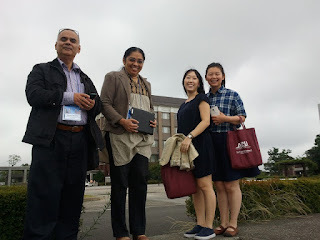 This was in 2015, when we went for a conference at Beppu, a small town known for its hot springs- the onsen for bathing, and the likes of the above for sight-seeing. Above- A view of the Beppu harbour, and (below) a multicultural group of participants from Nepal, UK, China and Japan. We went out sight-seeing, and spotted this guy performing live. Although a monocultural society I was impressed by their efficacy, helpfulness and cleanliness (perhaps not having too many varying opinions is a good thing?). I would like to visit the islands again.